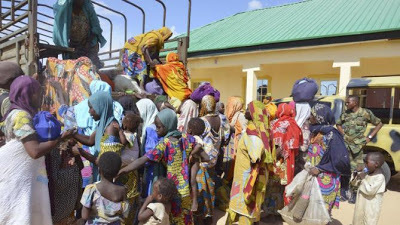 The Nigeria Army says so far, it has rescued about 7,898 civilians from Sambisa forest, a stronghold of the Boko Haram sect in Borno state. Lucky Irabor, theatre commander of Operation Lafiya Dole, disclosed this during a press conference in Maiduguri, the state capital, on Wednesday. Irabor also revealed that eight foreigners, including four Chadians, three Nigeriens and one Cameroonian were recently arrested. He said troops have continued to record remarkable progress in the fight against insurgency. “On the 7 February, troops killed 13 Boko Haram insurgents at Sabarmari, Siraja Anzayi, at Chongodo village, while arms and ammunition, vehicle and anti aircraft guns were recovered as well as five women and children whom we suspected to be family members of Boko Haram,” he said. “Nineteen Boko Haram terrorists were also killed at Butali Kura in Bulabulin axis and arms, ammunition were also recovered. List of terrorist names were also found one of the terrorist and four copies of the Holy Quran. During the operation, 59 women and children were rescued and are currently being profiled here at the theatre command.